He sounds distracted, faraway. Not cold, but not warm. Not how you might sound if you haven’t talked to your daughter in months. “Thanks,” I say. “I’ll see you then. Bye.” I wait for his goodbye but only hear the soft click of the receiver. They just need time to get used to the idea of me being out of prison, of my return to Linden Falls. I am looking forward to this book. Enjoy. Wow. Not the kind of welcome you'd hope for. See this is the problem with TT…I want to read them ALL. This one though I think I'll be adding for sure. I love conflict. ha! ha! 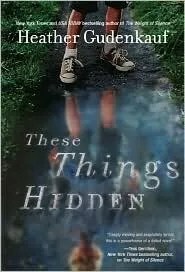 These Things Hidden is on my TBR. From the teaser, it sounds like an emotional book. Happy Reading!